Indian style Cucumber pickles is another way to enjoy the bounty of cucumbers. I needed to make a big batch of pickles quickly to serve with yogurt rice for a big, huge really, group. 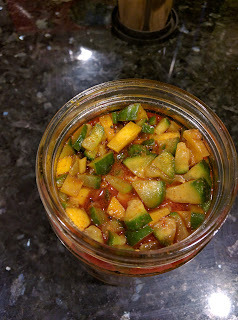 Although unripe mangoes would be the ideal ingredient, all I had in the fridge were a big bag of cucumbers and carrots! Since there was no time to run out to the store, I made the pickles using the cukes and the carrots. The luscious pickle turned out to be a great hit - juicy, cool cucumbers and crunchy carrots, what's not to love? They have a faint aroma reminiscent of mangoes - even looks like it! Note: You may use hothouse cucumbers or other kinds instead of the Persian. If the cukes are mature, use a teaspoon to remove and discard the core and seeds. Peel the cucumbers only if their skins are waxed; otherwise peeling is not necessary. The sesame oil used here is the Indian type; if it is not available, use your favorite mild-flavored vegetable oil. Citric acid is a white crystalline solid that looks like table salt and is available in Indian markets; it adds a nice tart taste to the pickles. Citric acid is naturally present in fruits and veggies; particularly more abundant in citrus fruits. It is also called sour or lemon salt and often added to commercially prepared foods and beverages. Combine the veggies and citric acid in a stainless steel, enamel or glass bowl and mix well. Grind the masala ingredients into a powder using a spice grinder. Heat the oil in a small pan and add the mustard seeds when hot. When the mustard seeds pop, remove from heat, add asafetida and then the ground masala, cayenne and turmeric. Swirl or mix with a spoon and pour over the veggies. Mix all the pickle ingredients thoroughly and spoon into sterile glass jars; push the veggies down to remove any air pockets and cover with lids. The pickles are ready to eat right away; but if you use fenugreek, it is good to give a day or two for flavors to meld and develop as well as give a chance for fenugreek to soften. I like to leave it on the counter top for about 2 or 3 days to cure as this gives the veggies a chance to develop lactic fermentation. If you go this route, make sure the veggies are covered with a thin layer of their liquid (if needed, you can add 1 or 2 tbsp of brine to top it off; make brine by dissolving 1 tsp salt with 1/3 cup of filtered or boiled and cooled water at room temperature) and shake them and let the carbon dioxide build up out once a day by slightly opening the jar. Store in the fridge and use as desired; the pickles will last a couple of weeks at least if it doesn't get gobbled up! Delicious served with rotis, dosas, idlis, upma, rice dishes, etc. Try this with Non-Dairy Yogurt Rice! Enjoy! !